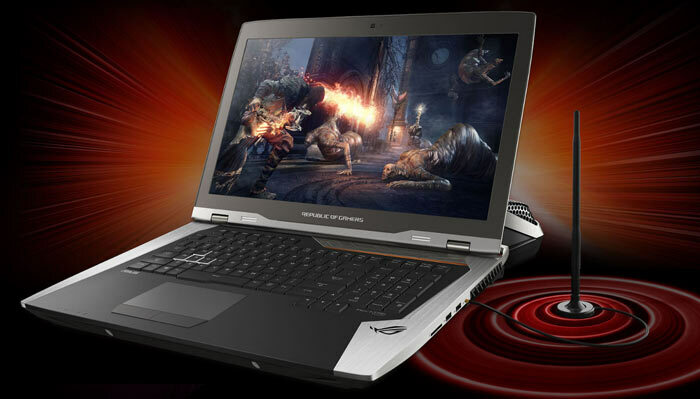 Asus ROG surprised with the launch of the GX700 gaming laptop a little over a year ago. This machine was built for 4K gaming on the go, and to run flat-out required a large 'hump' or 'wart' with integrated hybrid liquid cooling system to be attached. At Computex this summer we saw an update to the GX700 first touted alongside the unveiling of Project Avalon at the 'Join the republic' press event. Now Asus ROG has officially announced the new GX800. 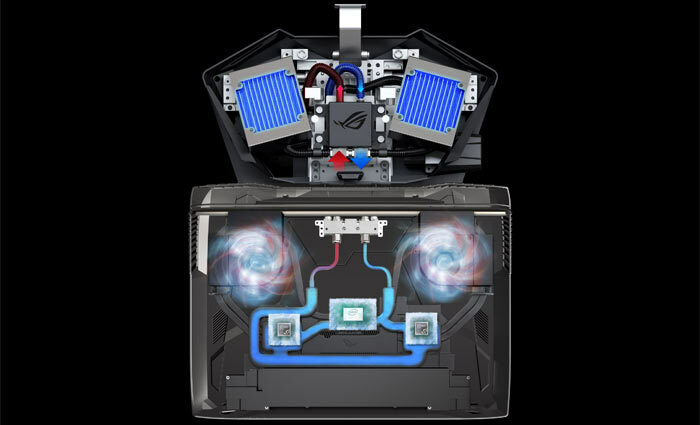 Like the GX700 before it, the Asus ROG GX800 uses the Intel Skylake Core i7-6820HK processor. This is a 45W TDP 4C/8T processor that normally runs at base/boost of 2.7/3.6GHz. The Asus Hydro Overclocking System wart boosts the processor clock to 4.2GHz automatically. DDR4 memory in the machine can be clocked as high as 2,800 MHz. Graphics processing gets a massive update: the GX800 replaces last year's GeForce GTX 980 GPU in the GX700 with a pair of GTX 1080s. Asus says that the GPUs are overclocked to 1,961MHz, with video memory pushed to 5,200MHz. The machine running with the clocks mentioned above achieves a score of 10,395 in 3DMark Fire Strike Ultra. 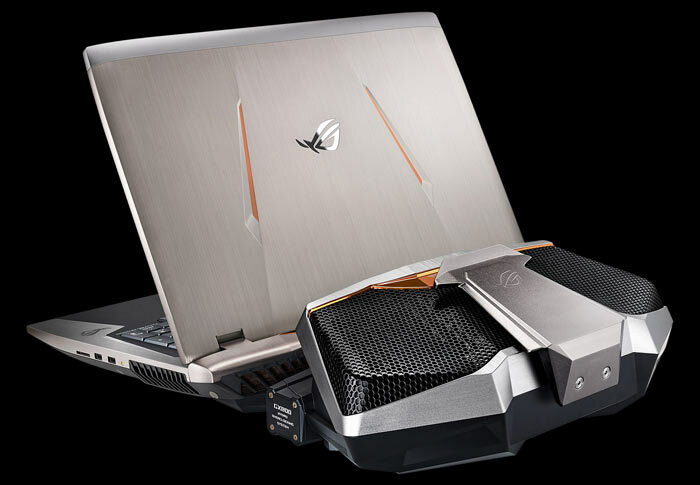 Asus ROG aimed to minimise any compromise with this gaming laptop, so beyond its raw processing power Asus has implemented other choice PC technologies. For example, the GX800 is fitted with a 18-inch Ultra-HD (3840x2160) 100 per cent Adobe RGB display with G-SYNC. It includes a MechTAG keyboard with mechanical switches (2.5mm of key travel, 100 per cent anti-ghosting with 30-key rollover) and AURA RGB backlight effects for individual keys. Storage is catered for by three M.2 NVMe SSDs in RAID 0 configuration. Other niceties include; a Thunderbolt 3 interface, 802.22ac Wi-Fi plus external antenna, and a high-end ESS SABRE headphone DAC and amplifier. 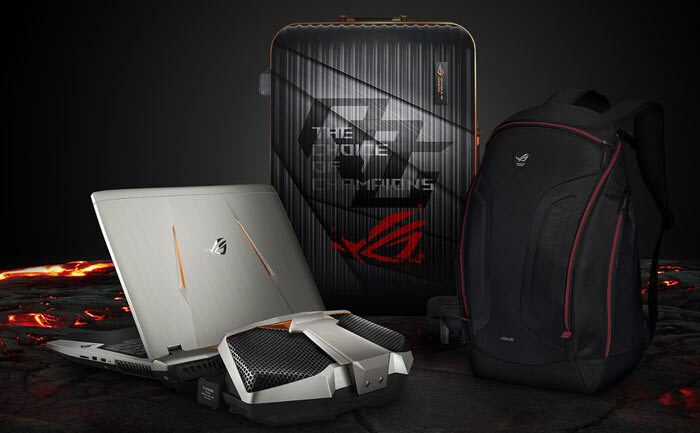 Asus ROG bundles the new GX800 with ROG backback and suitcase for the laptop, cooling 'wart', and twin 330W power adaptors. Quality luggage will be attractive to future owners, as the GX800 weighs 5.7Kg alone, and the Hydro Overclocking System is 4.7kg. Asus ROG hasn't published pricing and availability details, however it did say the GX800 was "coming soon" back in mid-June. 'Hump' or ugh ‘Wart’? Why not ‘Tumour’ or ‘Blob’? Can't you think of something a bit more palatable & techy? They've missed a real opportunity IMNSHO - "HydroDock™"
My god that is an engineering monstrosity…. there are so many more compact designs they could have come up with. They could have used a ‘tube’ with air blowing from one side to the other with a coil with fins taking the water down the tube..
At that size I may as well just get/take a small form factor pc and a screen…. Am I understanding correctly? 10.4kg, for the whole thing… I mean, at that weight it's almost as convenient to stick your PC in a suitcase and cart that around instead - monitor and all.